Impressive 13/15/19th C. Castle for sale furnished. Opportunity to buy a Chateau from the 13/15 and 19th Centuries, for sale furnished. Combining architectural features from Renaissance Medieval & 19th century, with 815m2. Two houses and two reception rooms in outbuildings, further scope for commercial use. Elegant 18th C. Chateau for sale near Beaches. A chance to buy an 18th C. Château near the Normandy coast and Caen, entirely and beautifully restored and set in gorgeous grounds with matire trees and extensive lawns.There are horse boxes, a riding ring, fenced paddocks, a dovecote, guest flat, garages and moats. Fine 17/19th C. Château for sale in Burgundy - Views. Beautiful south facing 17th C. Château for sale, with 19th C. Additions. Once a Hunting Lodge there is a Guest House and lovely grounds including meadows and forest and a space in the orchard planned for a pool, already with pool equipment and connections. Extremely attractive renovated 15th century castle for sale. Very attractive 15th century chateau, modified during the 18th century and recently renovated. 600m2 of habitable space. Exceptional setting. Originally a classic plan Bourbonnais 15th-C fortified house with a main rectangular building flanked by two round towers. Authentic 19th C. 'petit Château' for sale in the Berry. A 19th Century Castle for sale, evocative of a by-gone era with some beautiful period features and enjoying an unrivalled view of the River Loire. Framed by a forest the property has a swimming pool & tennis court and a garage with flat above. Restoration in progress. 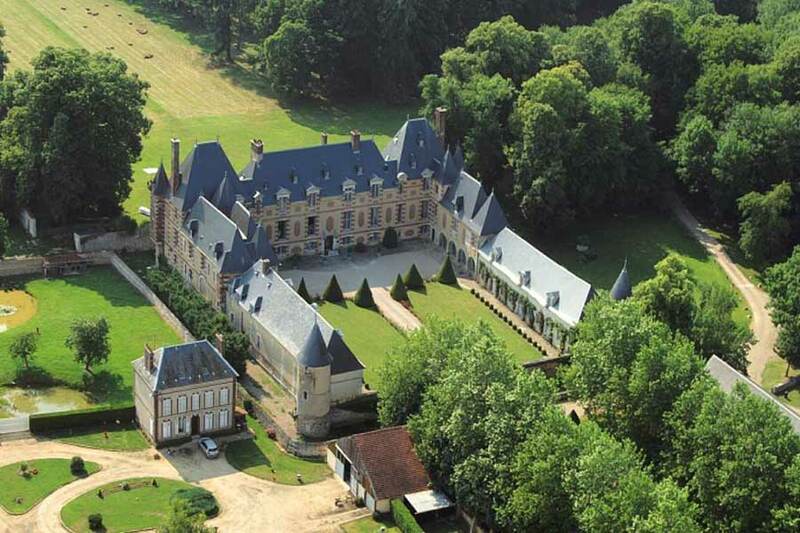 A remarkable 17th C Château for sale, situated 75 km west of Paris and is easily accessible by train and motorway. The Seine valley is reputed to have inspired numerous XIXth C painters and is still a dynamic tourist destination today. Surrounded by dry moats, the Château was built at the beginning of the XVIIth C and subsequently modified over the years, but has conserved its original character and has retained many period decorative features. It has been renovated by the current owners who have created comfortable modern living accommodation (total 2,100 m2) while respecting the important historical aspects of the building. Formal gardens add charm to the courtyard which is approached via a plane tree-lined driveway and a bridge over the moat. The property is set in extensive 20-ha informal grounds with mature trees. 19th C. Folly for sale on the Canal du Midi. A rare chance to buy a French Chateau on the Canal du Midi. This charming 19th Century folly has 299m2 of living space and a garden of 2,100m2. Lovely park with old trees, pond, flowerbeds, .Not overlooked Peaceful. Charming!